Ok. I rediscovered my George Foreman Grill two weeks ago. Easy, quick, easy to clean. I’ve cooked london broil (I think) and chicken breasts in that time. Today, I wanted pizza. Really badly. There’s so much in my neighborhood in walking distance. HOWEVER, I’m committed to save money, and for the same amount I could buy food to cook to eat over more than one meal. So I bought London Broil again, intending on eating a bit for dinner but saving some to eat for two+ lunches over the weekend. I even marinated it first. This was going to be good. 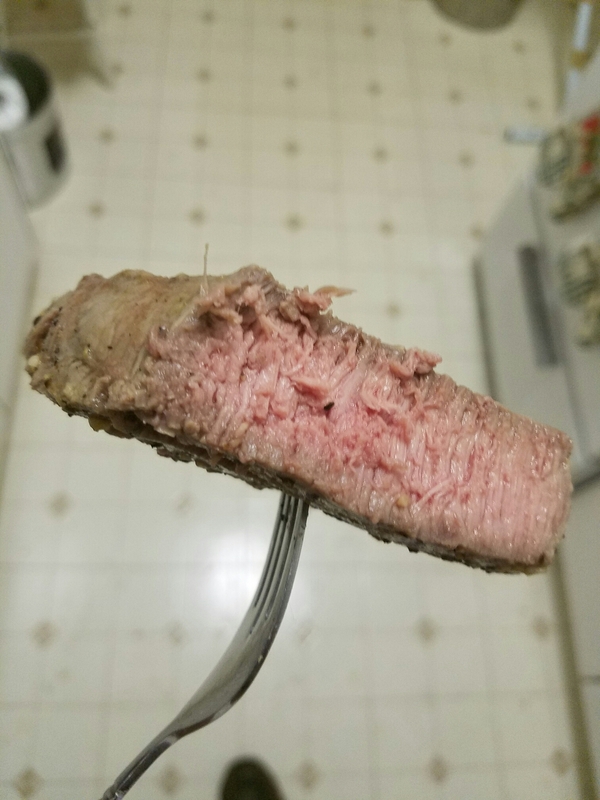 I usually like my steak medium rare to medium. I don’t go by the suggested cooking times. Actually, I’ve never looked at them. Hadn’t dawned on me. I just cut it open occasionally and eyeball it. Sounds like a solid plan, right? That’s medium -, maybe medium well +. Probably 30 seconds too long. Eating the bit tonight was fine but microwaving it on future days might make it all well-done. Oh well. It’s not burnt through and through. Live and learn. Happy grilling all! Thanks George! Steak is so expensive at grocery store I think it’s cheaper to eat at steak house restaurant.